"The Tattoo Artist" was published in Brenda Magazine online as a preview for their upcoming BLOOM edition. It was inspired by a tattoo artist who inks beautiful botanical designs for women who have had mastectomies. Read it here. "Papaya" appeared in the latest issue of Gambling the Aisle. I wrote this one because some dear friends of mine were expecting, and they referred to their little baby bump as "the papaya," which I thought was the most adorable thing I'd ever heard. The editors remarked that the poem "embodies the risk-taking spirit that our magazine treasures." Read it here. "Achilles' Fetish," which could be considered either a flash fiction piece or a prose-poem, appeared in Io Literary Journal online, in their Refraction section. It's the testimony of a prostitute who serviced Achilles during the Trojan War. Read it here. Three poems appeared in the Warriors with Wings, "I Dreamt James Baldwin Was My Father," "The Peanut Festival," and "Unused." 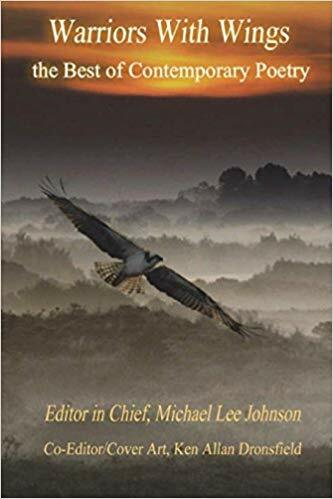 This anthology was edited by imminent poets Michael Lee Johnson and Ken Allan Dronsfield, and I am thrilled to be included. It's available on Amazon here. Finally, I just want to share with everyone that it looks like I'm track to release Necropolis, (The Order of the Four Sons, Book V) in September. I am working with artist Erin Kelso on the cover design. As usual, I can't wait to see what she comes up with. In case you missed it, there's an excerpt available here.